Manual, repetitive processes take time, introduce errors and drain employee morale. 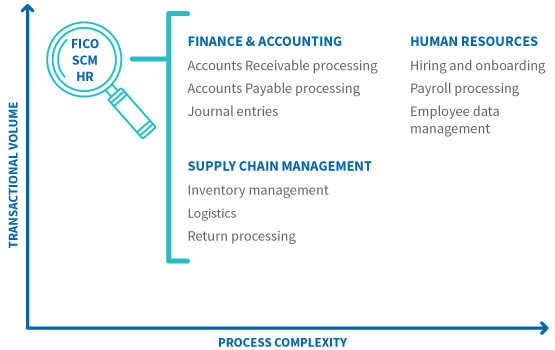 Winshuttle software “takes the robot out of the human,” potentially saving thousands of hours, enabling your staff to focus on higher-value tasks and make an impact on the business. Winshuttle partners with Blue Prism to extend RPA capabilities. 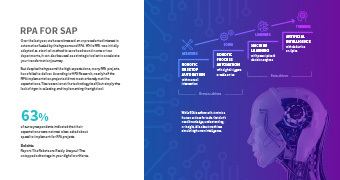 RPA is ideal to quickly tackle high-volume, low-complexity structured processes, like those found in financial accounting, HR, and customer services. Automate these tasks with Winshuttle software and get the quick wins you need to continue your automation journey. Despite the recent hype around RPA, many projects have failed to deliver promised benefits and have been plagued by cost overruns. The reason in many cases is not the technology itself, but not choosing the right tool for the job at hand. If the process you’re automating involves your SAP ERP system, turn to Winshuttle—experts in SAP automation since 2003. Our software empowers business teams to quickly automate repetitive manual SAP processes, without needing technical programming skills. The result is faster ROI and more robust solutions compared to generic RPA tools not built for SAP. Winshuttle helps process tasks with speed and accuracy. It will process huge volumes in less time. Eliminate manual, repetitive data entry, improve morale, and free up time for higher-value work. Empower business teams to build robotic solutions—without technical programming skills. Designed specifically to automate SAP processes. Deploy robust solutions in weeks or even days for fast ROI. Proven success with thousands of happy customers around the globe. Part of a comprehensive SAP data management platform to automate any process—from simple to complex. Works across your SAP landscape and is certified for ECC and S/4HANA on-premise. We’re seeing productivity improvements on the order of 25,360 hours per year, which is equal to approximately $1.3 million in personnel costs. In addition to all that, we’re saving about $525,000 annually by booking receivables earlier than ever. So, I guess you could say that we’ve seen much more than a return on our Winshuttle investment. We will see the return many, many times over.